Have you ever heard of the Bras d’Or Lake? When I arrived, I was told that the Bras d’Or Lake was the warmest body of salt water north of South Carolina, and I have never forgotten. I have also never forgotten how beautiful the area is and how nice the local people are. 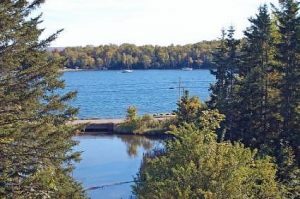 Located in Nova Scotia, Canada, the Bras d’Or Lake is an excellent cruising location for crewed yacht charter. I loved the time I spent both cruising on the lake and touring the surrounding countryside, in this beautiful area of the world. Alexander Graham Bell is close by in the city of Baddeck along the shores of the Bras d’Or Lake. The Bell family enjoyed the lake waters as well, sailing on their yacht Elsie, which is in commission today and available for day charter.The Bras d’Or Lake covers over 360 square miles, sitting right in the middle of Cape Breton, and is still as pristine and lovely as it was when Alexander Graham Bell was drawn to these shores. Sometimes referred to as the Bras d’Or Lake(s), this body of water is divided into a northern and southern basin, connected by the Barra Straight. The waters support a large population of salt water fish and shellfish including lobsters and oysters. The surrounding hills are largely unpopulated and have become the home and nesting grounds for Egrets and Bald Eagles. There is a small northern entrance to the lake from the Atlantic Ocean. 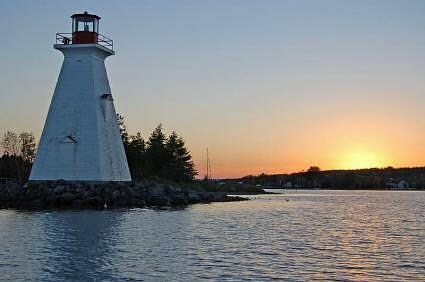 However, the best entrance into the Bras d’Or Lake is on the southern end, through the St. Peters Canal, built in 1868. Once inside, a calm oasis of water is found for comfortable cruising. As the lake is relatively shallow, the water temperature warms quickly under the sun resulting in far less fog within the lake region than outside this region on the Atlantic coast. These warmer lake waters also invite swimming and other water sports, at normally unheard of northern latitudes for salt water swimming. With the indented shoreline of the lake, it is not hard to find a private pristine anchorage, where oysters can be plucked from the bottom and eaten out of hand, and a refreshing swim in calm waters is just a drop over the side. Cruising the warm and tranquil waters of the Bras d’Or Lakes is a jewel hidden in the middle of Nova Scotia waiting to be explored on your next yacht charter.